Anne, the princess of a human kingdom, is so prodigiously talented with magic that her power can be overwhelming. Grea is a Dragonborn princess, complete with horns, wings, and a scaly tail. Both can feel isolated in ways by their position or personality, but they become close friends with each other when they meet as students at Mysteria Academy of Magic. Over the course of time, they delight in each other's company, whether that involves a shopping excursion, playing the piano together, or maintaining the Academy's library during a vacation break. Their relationship continues to grow under the watchful eye of fellow student Owen, a paladin in service to Anne's kingdom. This offering from the winter 2019 season has a more convoluted production history than most. Originally titled Rage of Bahamut: Manaria Friends , it was announced in 2015 and scheduled for broadcast in the Spring 2016 season, but for unknown reasons its entire production staff was removed only a month beforehand and production was delayed. 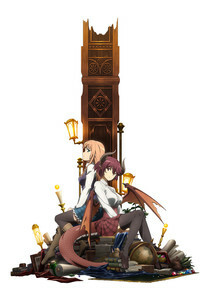 In late 2018, it was re-announced for broadcast as just Manaria Friends , with Cygames Pictures taking over the series' animation. Both Crunchyroll and licensor Sentai Filmworks list the series as Mysteria Friends instead, which is fitting given that the name used for the academy in English versions of the Bahamut franchise is Mysteria. The series is based on an event in the Rage of Bahamut digital CCG; while it is set in the same world as the anime series Rage of Bahamut Genesis and Rage of Bahamut: Virgin Soul , its story is entirely disconnected from them. No familiarity with either of those series is necessary (or even particularly helpful), nor is any familiarity with the source game or event. In fact, coming into this series as a complete newbie might be best, as that might help avoid some misconceptions about the series' very different goals. Where the other Rage of Bahamut-based anime are bold presentations of high fantasy, Mysteria Friends instead blends its "sword and sorcery" fantasy imagery with high-school slice-of-life. (Episode 9 is even titled “A Slice of Life.”) The result is a story where magic is definitely present and sometimes used ostentatiously, but only one of the ten episodes primarily focuses on action scenes, and only a handful of others have any significant degree of intensity. There's also not much of an ongoing story to Mysteria Friends . There is some continuity between episodes, but they're largely short standalone vignettes rather than an ongoing narrative. Anyone coming into this series expecting a more active plot would be sorely disappointed. Instead, the series offers a pair of heroines that are adorable on their own and even more compelling as a duo. Anne is bright, cheerful, and passionate, definitely dorky and charmingly horny when she gets time alone with Grea, who for all of her dragon traits is the more elegant and reserved one, an easily embarrassed young woman who doesn't like to outwardly show her emotions, though her tail often gives her away. There are a number of other recurring characters as well, most notable the paladin Owen, who's always present somewhere in the background watching over Anne (spotting him in various scenes can be a “Where's Waldo” experience), and the student council president Hanna, but with rare exceptions, supporting cast members revolve around the two leads rather than having their own stories or development. This isn't entirely a two-woman show, but it's pretty close. The technical merits for Mysteria Friends are remarkably high for a short series. Granted, each episode is able to reduce its necessary animation by reveling in the gorgeous background designs, but the staff doesn't skimp on animation spectacle either, even in details like animating characters' legs moving when they tread water. Character designs are attractive and rarely slip off-model, and the show's overall color palette is sharp and vivid. This was easily one of the better-looking series of its season, and it was also among the better-sounding ones, with a musical score heavily reliant on slow and gentle piano pieces, though it is capable of silly or more dramatic numbers as warranted. Overall, Mysteria Friends is definitely not going to be everyone's cup of tea. It plays out on the slow side, to the point that some may find it boring. However, the series accomplishes its goals as a soothing slice-of-life with a sprinkling of yuri extremely well, with many lovely and memorable scenes where the girls just basically hang out together. I have no regrets about choosing it as my favorite anime of this past winter.